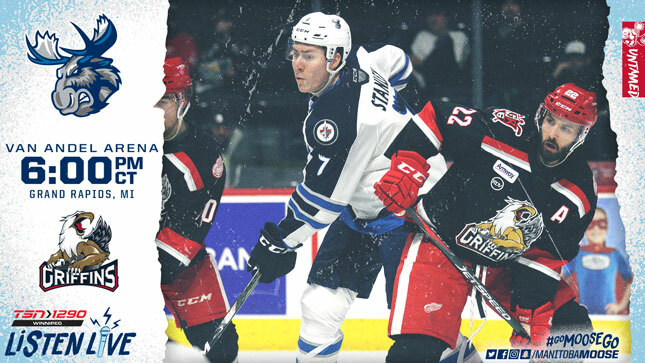 The Manitoba Moose (20-20-3-2) are in Grand Rapids tonight, to take on the top team in the AHL’s Western Conference, the Griffins (26-15-3-4). The 6 p.m. CT puck drop will be broadcast on TSN 1290, moosehockey.com/listenlive/, the Moose App, and streaming live on AHLTV. Tonight’s game will be the 100th meeting between the Moose and Griffins. Historically it’s been Grand Rapids who’ve gotten the better of Manitoba, leaving them with a 36-46-11-5 record in 99 IHL/AHL matchups with the Griffins. The Moose have been picking up points lately, going 7-2-1-2 in their last 12 outings, but have only beaten the Griffins once in six meetings this season. The victory came on Nov. 10 when Kristian Vesalainen (2G) and Mason Appleton (1G, 2A) combined for five points in the 6-2 win. Heading into tonight’s contest, the Moose have revenge on their minds from their most recent game against the Griffins (Jan. 23), when Carter Camper found his second overtime winner of the season against Manitoba. If the Moose are going to exact that revenge, forward Seth Griffith says they’ll need to effectively use their down time since Saturday’s loss to the Wolves. 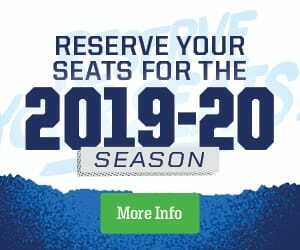 Against Grand Rapids in 2018-19 the Moose have seen production up and down the lineup. A total of 12 different players have found the scoresheet more than once against the Red Wings affiliate this season. If the Griffins are going to focus on a Moose player, Griffith would be a strong candidate. The forward is currently on an 11-game streak totalling 15 points (1G, 14A). That run moved Griffith into the Moose scoring lead, and he is one game shy of tying the longest point streak in the AHL this season. Griffith was asked if he’s trying to block the streak from his mind in order to keep it going. Following Wednesday’s contest, the Moose head home for a pair of games against the Texas Stars to start off a six-game home stand. The first of those games (Feb. 9) is the club’s Multicultural Night, which will include performances provided by Folklorama. Sunday’s rematch with the Stars (Feb. 10) is the annual Polar Bear Jersey Day in support of the Assiniboine Park Zoo Polar bear Rescue Team. A specialty jersey will be worn by the team and auctioned off on the concourse during the game and online afterwards. For tickets to these, and all other home games, visit: moosehockey.com/tickets/.